Dental operating lights or dental operatory lights are a standard fixture in every dental practice, because without these lights dentistry would be literally in the dark ages. Something as simple as lightning the oral cavity can actually make or break the success of a dental operatory. Operatory lights are permanently mounted to the ceiling, cabinet, wall or delivery system and have a variety of swing arm options. 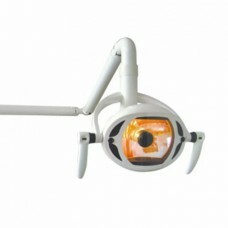 The dental surgical light for sale is powered by either halogen or led technology and are adjustable to the needs of the dentist, hygienist and assistant. When choosing a light for your operatory, ensure it works with your delivery system, cabinetry and if your preferred position during procedures is compatible. Different lights have different color temperatures and lux (light intensity ratings), so be sure these are compatible with the rest of your operatory lighting. Dental surgical lights top magnification technology to benefit your patients, your practice and yourself, now is a great time to take a closer look! Join the growing number of dental professionals who depend on this dentist equipment for sale and optical magnification to improve accuracy, reduce stress and preserve long-term visual acuity. Surprisingly affordable chf series and sh series Loupes are made from the finest of optical coated lenses to deliver excellent clarity and high-resolution. A snap-on universal mount included allows for quick attachment of most led headlamps. Series Clip-on are identical to pre-mounted series Loupes but in a clip-on design. Strong, non-slip spring clip fits onto most prescription and safety glass frames in seconds. Each set is also complete with a locking lanyard, 3mm screwdriver, cleaning cloth and storage case. When Is Endodontic Retreatment Needed?